Size of this preview: 501 × 599 pixels. Other resolutions: 201 × 240 pixels | 401 × 480 pixels | 502 × 600 pixels | 642 × 768 pixels | 856 × 1,024 pixels | 2,802 × 3,351 pixels. [Pictures by Italian, Spanish, Flemish, Dutch, and English masters], British Institution, London, June 1829 , cat.no. 10. Exhibition of Works by the Old Masters and by Deceased Masters of the British School. Winter Exhibition, Royal Academy of Arts, London, 1890, cat.no. 145. The Art of Rembrandt, The Metropolitan Museum of Art, New York City, 21 January 1942 –?, no catalog. 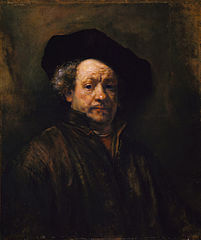 Rembrandt, The Metropolitan Museum of Art, New York City, 1952, no catalog. Portrait of the Artist, The Metropolitan Museum of Art, New York City, 18 January 1972 – 7 March 1972 , Cat.no. 8. Rembrandt/Not Rembrandt in The Metropolitan Museum of Art, 10 October 1995 – 7 January 1996 , The Metropolitan Museum of Art, New York City, Cat.no. 15. The Age of Rembrandt, Dutch paintings in the Metropolitan Museum of Art, The Metropolitan Museum of Art, New York City, 18 September 2007 – 6 January 2008 , no catalog. Rembrandt by himself/Rembrandt zelf, 5 June 1999 – 5 September 1999 , National Gallery, London, 25 September 1999 – 9 January 2000 , Koninklijk Kabinet van Schilderijen Mauritshuis, The Hague, Cat.no. 80. This page was last edited on 17 June 2018, at 14:49.